What is serenity? According to the dictionary it is the state of being calm, peaceful, and untroubled. That is how I feel when I use OmmWriter Dana. It is easily one of the most polished, albeit simple, “word processors” I’ve ever used. Giving it the classification of word processor probably isn’t fair to the likes of Microsoft Word or even Apple’s Pages app. It is order of magnitude less featured that either of those programs (especially Word) but I think there is a certain beauty to that. If you read the product description on the Mac App Store, it becomes clear that the developers really wanted to get back to writing. I’m going to take a quick screen shot now so you can see everything on my screen as I type this short article. Do you see that? The resolution is high so there’s more of it than what would be on most displays. 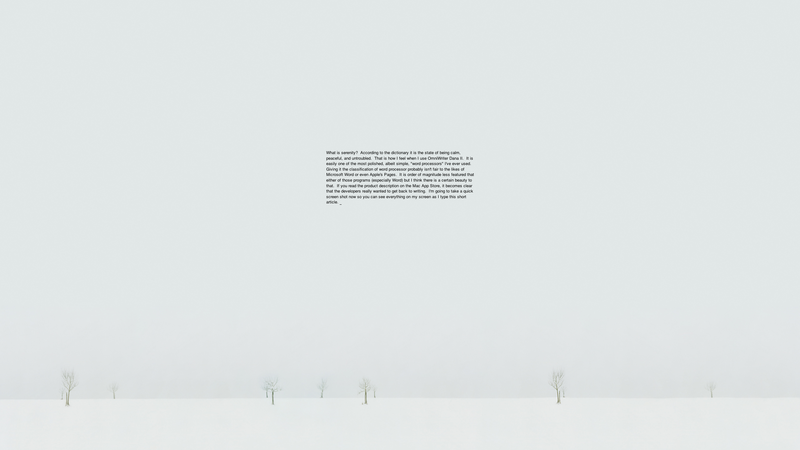 LOTS of white space, a few serene trees in the middle of winter and my text. There is some nice, relaxing music playing in the background, which is the main reason that the program encourages you to use headphones when you first start it up. Headphones help to further eliminate distractions and stay focused on getting your content down. The key to focus is removing as much outside stimuli as possible. With Dana II and a good set of headphones, you can accomplish that pretty easily. I could see myself sitting at a library or research desk going over all of my data and inputting things down for hours. On top of all of that, I feel really good as I write. I live in a world, or at least a culture, that seems to be focused entirely on the tangible. If it has more features, it seems to be automatically declared better. I used to think this way, but I’ve realized there is a better school of thought on how you define value. If value is defined exclusively as how many tangible things you get for your dollar, then simply stuffing any product full of features should automatically make it the best value. However, even the die-hard “feature hunters” will complain (and rightly so) about a feature poorly executed or implemented. That’s because there’s more to products than simply giving us lots of things to use. If a product has 1,050 features but I only use 50 of them, then the value of that product to me is really the price in light of those 50 features. You might be thinking, “But those extra features might be needed down the line.” Yes they could be, but making purchases based on something you might use isn’t really a good way to shop. First and foremost, you shop according to need. I admit, I bought Dana II because it went on sale and I had been curious. However, I’ve done more casual writing, putting thoughts down, and getting to projects I’ve been meaning to, more than I have in the past 3 years. Not kidding. Why? Because it’s the intangible concepts in Dana II that remind me of why I want to write, not simply what I need to write. There is something about the design that makes me feel like Dana II is saying, “Remember those projects you’ve been meaning to do? Let’s get started on some right now. I’ll help you get focused.” It may sound ridiculous, but no other writing tool I’ve used thus far helps me to do that at all. In summary, I highly recommend Dana II as a writing tool. I can almost guarantee that you’ll love it. As a word processor, you may want to look elsewhere. Or, even better, do what I do. Do your typing in Dana II and, should the need arise, use a greater featured word processor to format it to your liking or needs. Hey, I bought it, too! A week ago.